Taiwanese green propolis is a prenylated flavonoid rich honeybee product and propolins isolated from Taiwanese green propolis exert a broad spectrum of biological activities, such as anti-cancer and anti-oxidant. However, the anti-bacterial effects of Taiwanese green propolis or propolins are still poorly understood. In the current study, the antibacterial effects of Taiwanese green propolis and propolins were evaluated. Results show that the maximum dry matter yields of Taiwanese green propolis were observed in the 95% and 99.5% ethanol extracts compared to other extraction methods. Consistently, the highest concentration of propolins C, D, F and G from Taiwanese green propolis was obtained in 95% and 99.5% ethanol extracts. Propolins inhibited the growth of gram-positive bacterial strains (Staphylococcus aureus, Bacillus subtilis, Listeria monocytogenes and Paenibacillus larvae). The average minimum inhibitory concentration (MIC) and minimum bactericidal concentration (MBC) of propolins from ethanol extracts were 20 μg/ml. 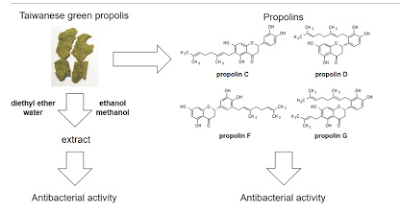 Among the propolins, propolin C had the highest antibacterial activity. Furthermore, Taiwanese green propolis also showed antibacterial activity against methicillin-resistant S. aureus (MRSA). In conclusion, these results demonstrate that Taiwanese green propolis and propolins have significant antibacterial activity, particularly against gram-positive bacterial strains.